Here is artist Deedee Morrison’s concept of the art she proposed for a downtown Albany site off Lyon Street. This pleasing prospect is a possibility now that the Albany Arts Commission has chosen an artist to fulfill the city’s mandate under the city’s 1-percent-for-art ordinance. The ordinance comes into play in connection with the completion of new buildings for the police and fire departments. The city council authorized $80,000 for the art project in January. Since then, the arts commission invited proposals, evaluated those from five finalists, and on Nov. 13 agreed that Deedee Morrison, of Greenville, S.C., should create a sculpture for Albany. Previously, the arts panel had picked a grassy spot near the Pacific off-ramp and Lyon Street as the site for this work. The council will get a report on all this when it meets for a work session on Monday afternoon (4 p.m. Dec. 3 at City Hall). Julie Jackson, chair of the arts commission, told me the sculpture can’t cost more than the city’s $80,000 budget. And while Morrison was picked based partly on drawings of what she proposes, the artist plans to come to Albany for a series of meetings to talk about the final design. “When visitors are near the sculpture, integrated sensors pick up the motion and trigger more animation and interactive sequencing of the lighting effects,” the artist says, explaining her concept. 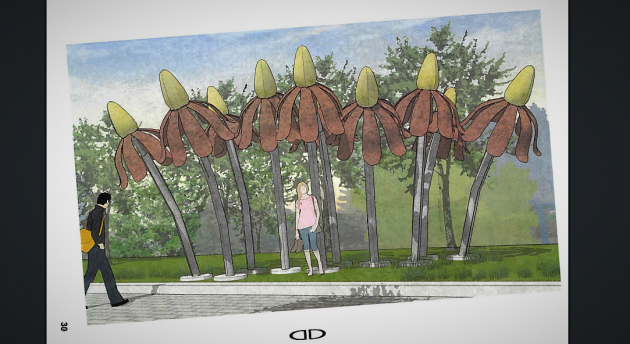 The site picked by the arts commission is controlled by ODOT, so Albany will have to request permission to put the shimmering wildlflowers there. I took this shot in January to show roughly where the sculpture would go. I think there are still a couple of the “neon horses” visible south of Newport? What about installing one of the neon horses? I think they originated with a West Coast artist? Huge daisies for $80,000? What has this world (make that this town) come to? And the artist has to be flown out from South Carolina? Don’t we have artists in Oregon? Of course we do. I loved those neon horses. I am looking forward to the big “Wildflowers” Can’t wait to see them. A big plus for Albany. Keep $80,000 in Albany or at least Oregon. Spend local!!! If you study the psychological underpinnings of the 2018 midterm election vote here in Linn County, it becomes clear that residents stand largely against whimsy and joy. The Electorate spoke clearly. Albany and Linn County are mired in the Status Quo. The idea that area citizens would spend 80-grand on whimsy is anathema to the local populace’s countenance. Lastly, why did the Commission pick an artist who resides in one of the worst states regarding Voter Suppression, racism and homophobia in the entire nation. It strikes me an artist from the Linn County area could certainly meet the low standards set by South Carolina and the $80K could have stayed here in Our Fair City. Exposure to the arts in various expressions has been lacking in this area. This piece will contribute to folks enjoying an outdoor art installation by creating some interest and knowledge of the art scene. Thank you for the vision! Does the $80,000 come from bond proceeds or the city’s general fund? If bond money, I wonder if the majority of voters who approved the bonds really understood that 1% of the proceeds was baked-in for whimsy and joy. If the general fund, I wonder if local property taxpayers understand that whimsy and joy are on equal footing with basic services. The issue HH identifies is a local one – you know, the ordinance you had a hand in passing. So please answer the question – did the $80,000 come from bond proceeds or the city’s general fund? Who said it would be? It came from bond proceeds. I dunno, the drawing of ten flowers that are 10-12 feet tall doesn’t stimulate much whimsy or joy in me. More appropriate would be ten umbrellas that are 10-12 feet tall with color changing LEDs. That seems more appropriate given it is Oregon. And umbrellas would generate more smiles, thus achieving the whimsy and joy objectives. Who knows, the city may get a dozen umbrellas for $80,000 out of the deal. But this is publicly funded art, so my bad for thinking of efficiency and cost effectiveness. Keeping with the whimsy theme, call it Bumbershoot Court. With a few benches underneath the area would also have some practical value. WOW….coneheads in Albany!!! 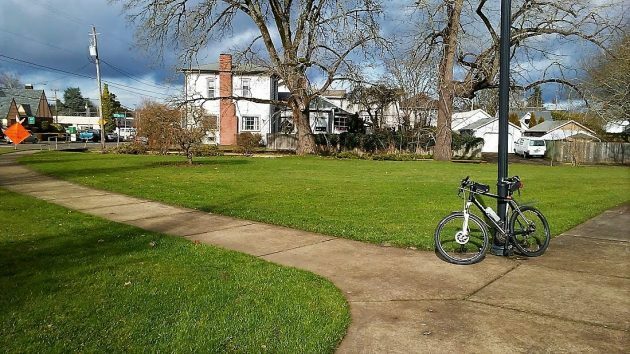 Hey City Council, if ya got $80K to fritter away how ’bout paying my property taxes this year? Or fix some of the pot holes along East 3rd, 4th, 5th & 6th streets!! It might make those residents smile. If that money came directly out of each Council members checkbook instead of our tax dollars they might not be so frivolous in their spending. Doesn’t Albany have a sign code that bans flashing lights? The 1 % mandate is fine. However preference for local or regional artist should be considered !! Goes well with the Boda sign on 1st and Lyon….Lol. Sorry I couldn’t help it. I like the idea! I also think it would be great to have umbrellas as art to perform a practical purpose both winter and summer. I do also like to use local artists, venders, etc! Seems interesting. Since I live in Corvallis, I’ll keep quiet about Albany’s financing of art. 1 – The lights and electronic controls are adequately documented, testable, fixable (or replaceable in small modules), and non-proprietary, so that city maintenance workers (or whoever replaces street-light bulbs) can easily fix the thing when something goes wrong. Otherwise, it could be an expensive service call from God knows who or where, or the thing going dark forever. 2 – All the electrical stuff can reliably handle the weather. Probably required by codes, but I just want to be sure. WOW!! another distraction for drivers. I’d be willing to bet that the incidence of rear end collisions on the off ramp increases tremendously. Did anyone on the Arts Commission even think of traffic safety???? Since this location must be aporoved by ODOT, we, on the Art Commission, were not too worried. By the way, there will not be flashing lights in the way you describe. If/When this artwork has completed the design stage can it have some Albany roots ? By that I request titanium from Oremet/Wah Chang be primarily used. My Trumpian Gut tells me hafnium is preferable. I like the idea of umbrellas. It’s Oregon! Local would have been nice if at all possible. Frankly, I don’t see much public art of recent vintage around Albany. There’s the classic McCullough work on the bridge and the metal sculpture on 1st. Other than that, Albany’s theme seems to be functional minimalist. I believe the most productive thing we can all do is let the city council and the arts commission know what we think of their selection and let ODOT know what we think of the proposed placement. This (final design) needs public input before it’s “on the books”. We are the ones paying for it. This public art sculpture would have more appeal if the “wildflowers” in the arrangement were not so ugly. Gordon’s suggestion of umbrellas with changing colors of light would be preferable unless a more aesthetically pleasing wildflower design will be selected. Also, one percent of municipal project money being spent on art to enhance public spaces is money well spent if properly executed, IMO. Who pays for the installation and usage of electricity? How much? Who pays to fix it when the first good wind storm defoliates it? How much? Many of you have commented about local artist. This was definitely a part of the discussion but not a part of the RFP process. The Arts commission felt that it was important to get a broad array of art to choose from. Art is intended to generate discussion and we as the Arts Commission are grateful that there is so much discussion on this blog about the project.